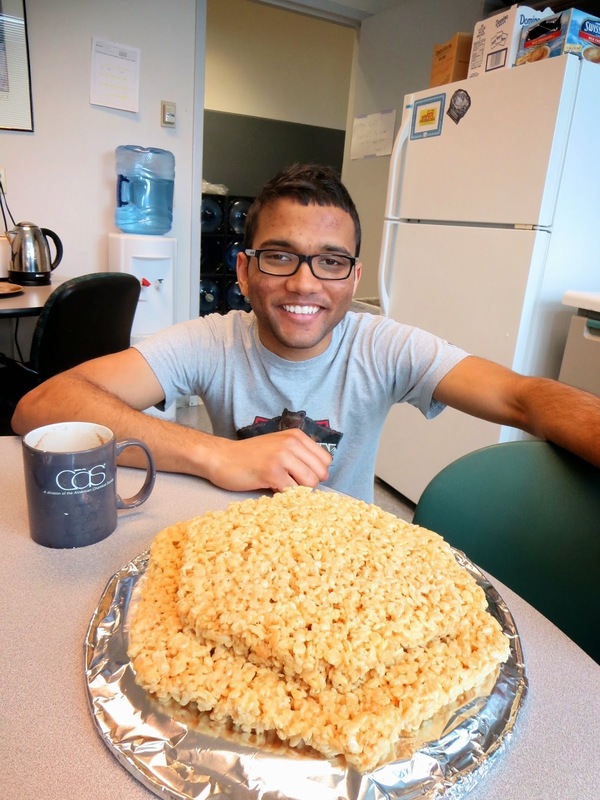 Today’s cake hour was determined by the sort of departure of one of our former research assistants turned graduate student. 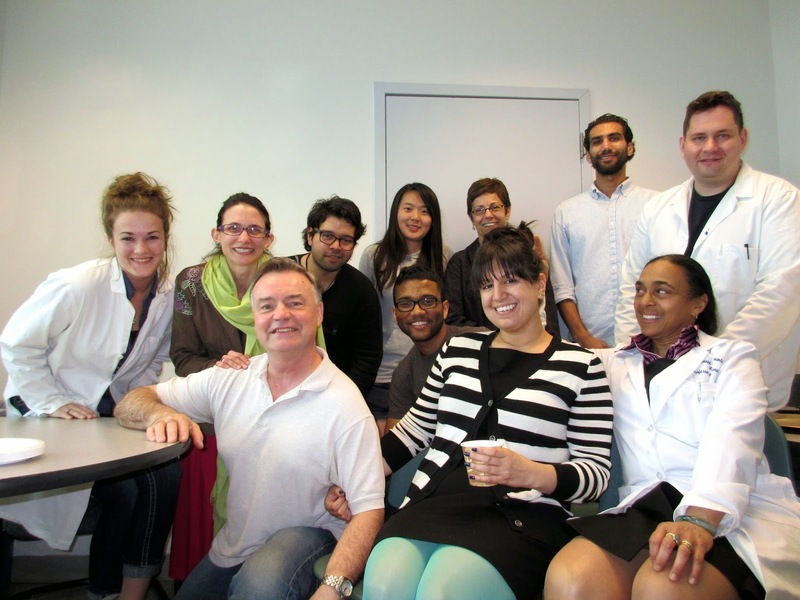 Actually she technically left the lab to become a grad student a while ago but was still involved with the research. She also did some more work as part of her grad rotations but the day had to come when she would be assigned to a lab and it was not ours. So we said sort of goodbye because she will probably end up hanging around again at some point. Since her heritage is Bolivian her heretofore mentor decided our departee should be feted at a Bolivian restaurant. Time to send her out into the real world. A couple of things are going on here! 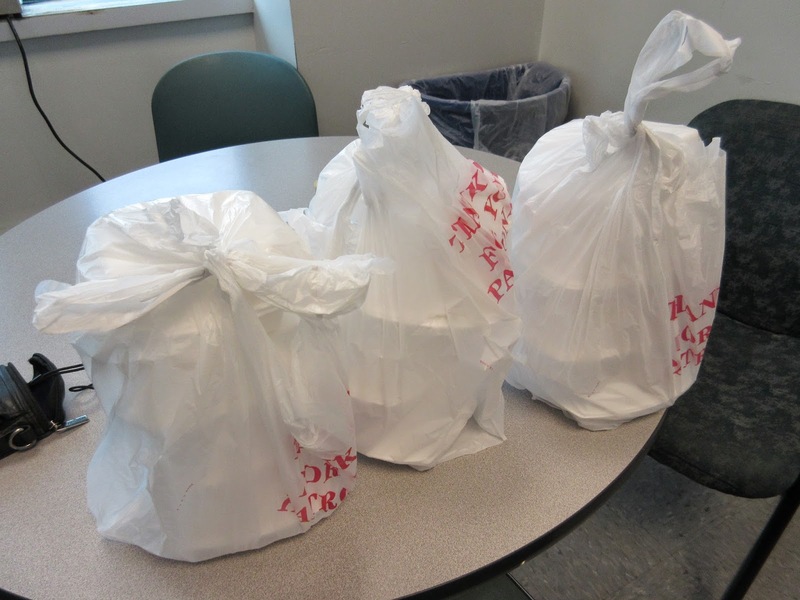 They had a nice lunch and for the cake hour farewell they bought a bunch of desserts from the restaurant. 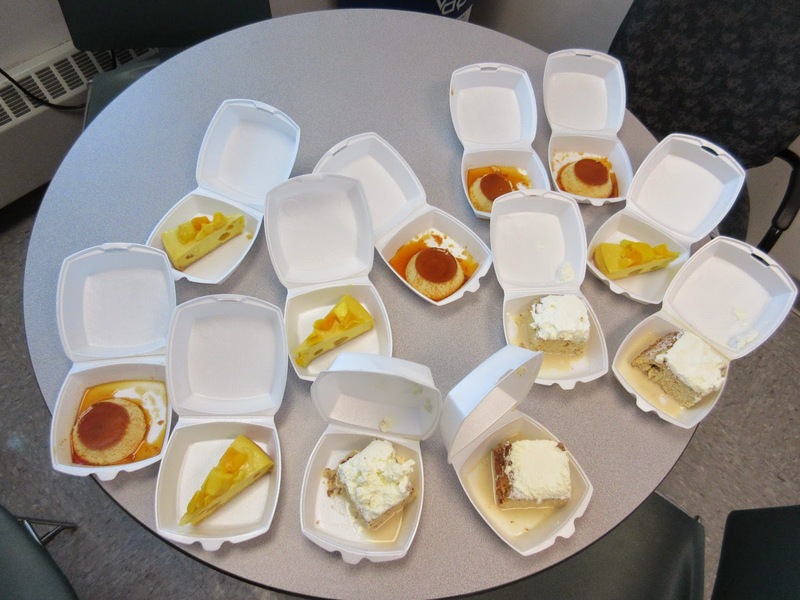 The specialties included the obligatory flan and a tres leches cake or torta de tres leches. This is a sponge cake—in some recipes, a butter cake—soaked in three kinds of milk: evaporated milk, condensed milk, and heavy cream.which translates as three milks. Heaven knows how they came up with that idea but it has been around since the Middle Ages. 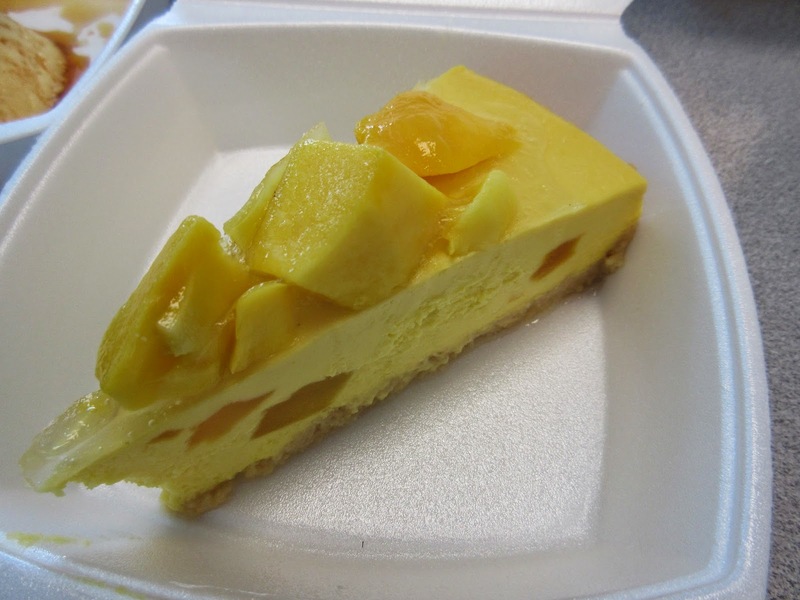 The third treat was described as mango mousse cake. 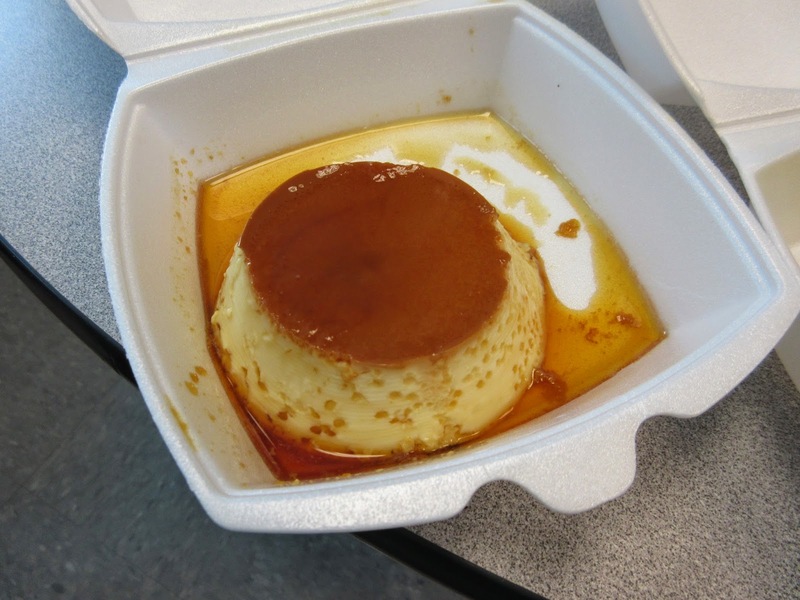 Are you a flan fan? 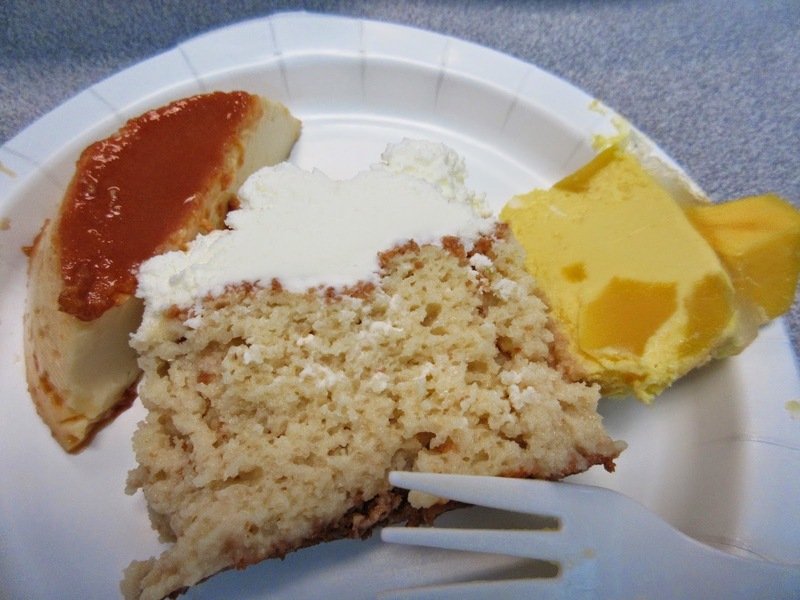 Three milks cake or torta de tres leches! Is it a mousse or a cheesecake? Not a bad little selection at all! 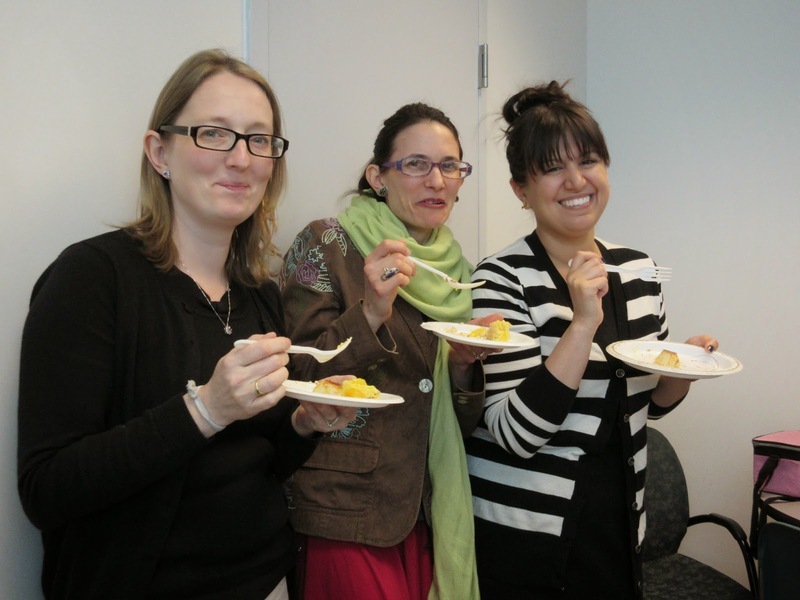 We have had flan and even a flan competition before so we are very versed in what it should be. This one was very good and even met the expectations of some diehard flan fans. 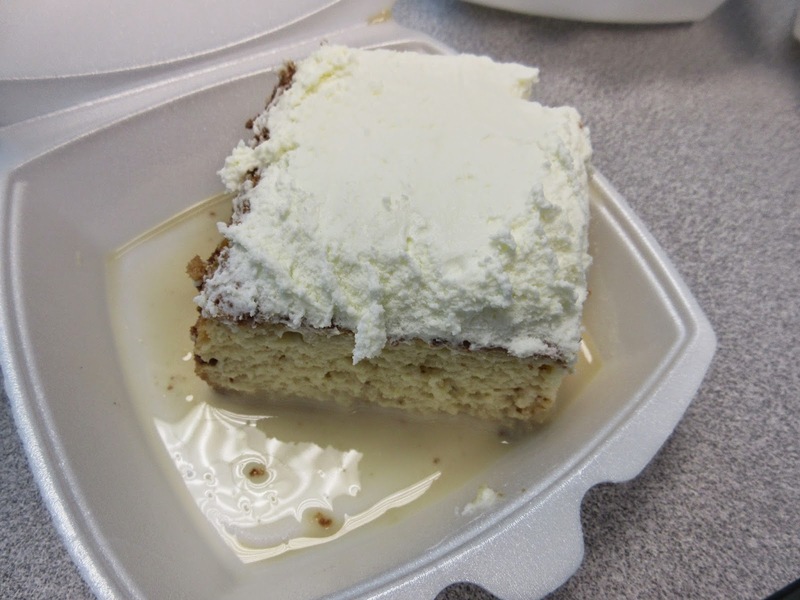 The tres leches cake was the best we have had probably because it was made more correctly than what we have had in the past. The mango mousse didn’t really taste like mango mousse but had the consistency of a mango cheesecake. With that in mind it made for a tasty cake but would be a very pasty mousse. We will assume that it was indeed a cheesecake. When it comes to dessert ¡Viva Bolivia! The final 10 second shot with the gang! So the Bolivian theme worked well to bid farewell to our colleague. 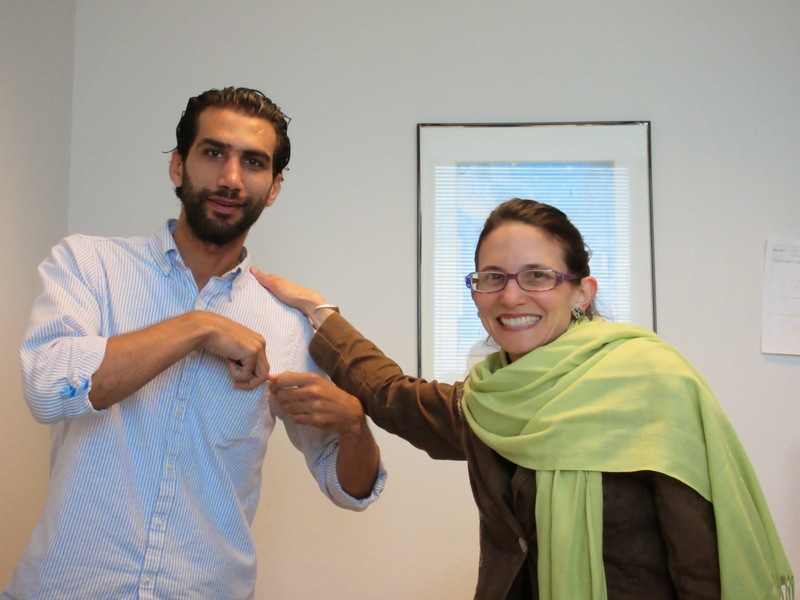 We were also saying au revoir from one of our colleagues with an Arabic heritage. Of course these treats had nothing to do with that but there was no baklava to be had. 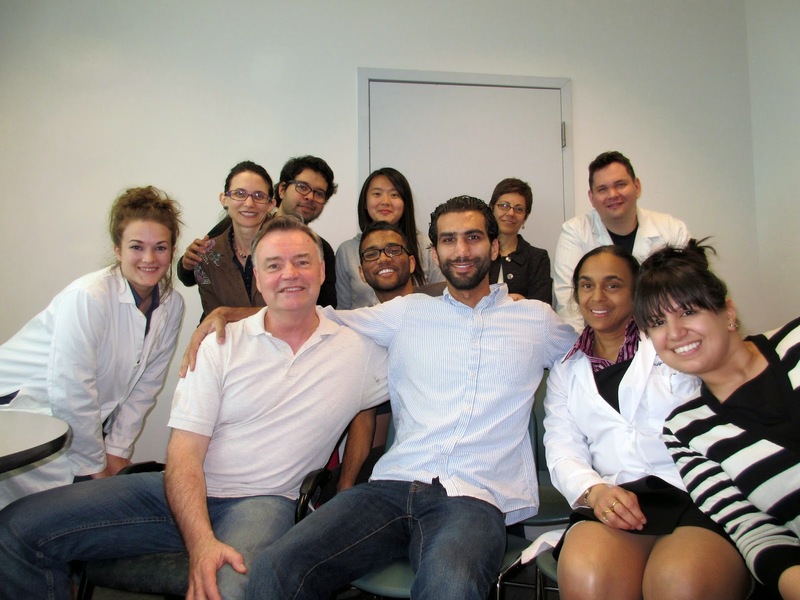 So we just included him in the celebration and sent him off to his residency in beautiful and stimulating Roanoke, Virginia. 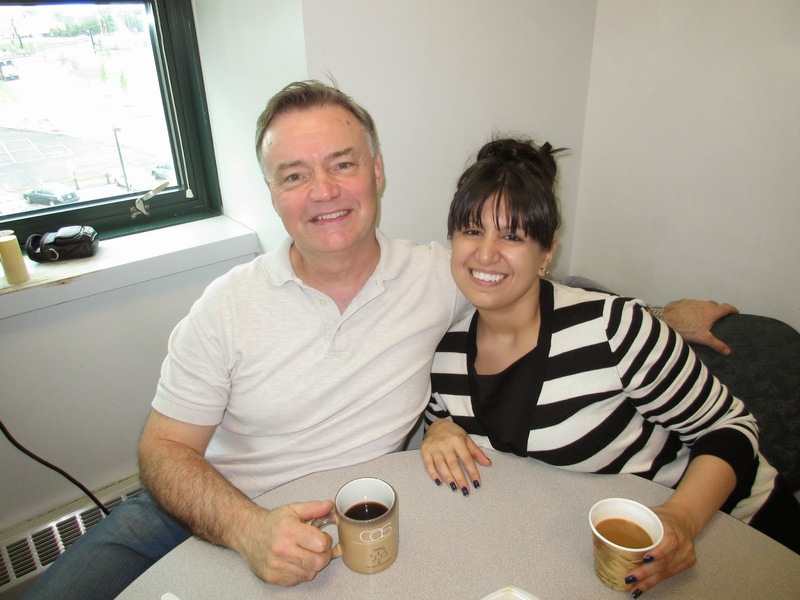 Au revoir, notre ami and we wish you great success and great fun in VA! Time to send him off into the real world! Did she slip something into his pocket! The 10 second shot says وداع، وسيم! And it's off to sunny Roanoke - don't look so thrilled! 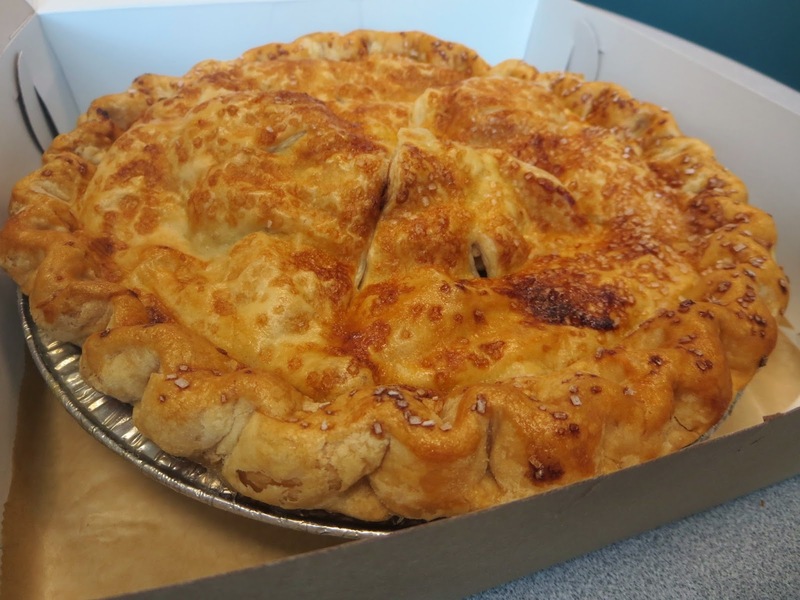 Quite a pie from the Red Hen Bakery. Today we had a treat from Vermont which had nothing to do with maple syrup. Years ago in Middlesex, Vermont a camp was built to house workers for the Civilian Conservation Corps an agency of the New Deal that provided unskilled manual labor jobs related to the conservation and development of natural resources in rural lands owned by federal, state and local governments. The CCC lasted until 1942 after the onset of WWII. 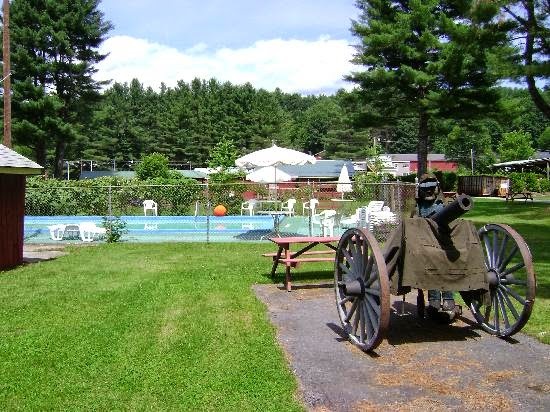 Camp Meade became a few different things since then including a Motor Court/Motel with a military theme. The proprietors collected some military hardware and would service the cottages with vintage jeeps and every now and then fire up the tank or the airplane. There was a Victory Museum with quirky depression era things but also a pool and a restaurant. For a great review of the Camp Meade motor court go to this link: http://articles.philly.com/2000-03-05/news/25604044_1_cabin-army-ambulance-indoor-pool. 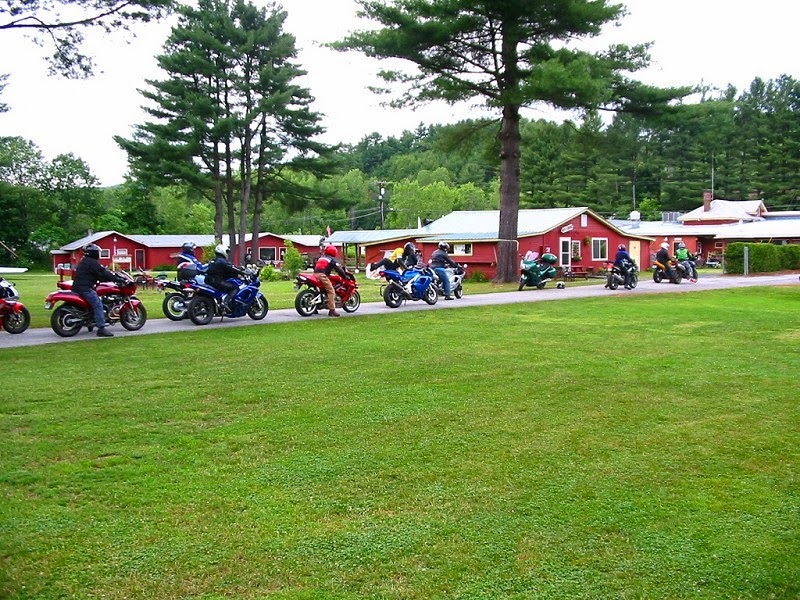 Camp Meade cottages and bikers! 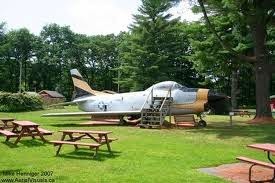 You couldn't miss the plane by the picnic area. Nor the Howitzer by the pool! However times change and throwbacks to the 30s ultimately fade. The genuine oddity of Camp Meade gets replaced by among other things an ORGANIC BAKERY!! 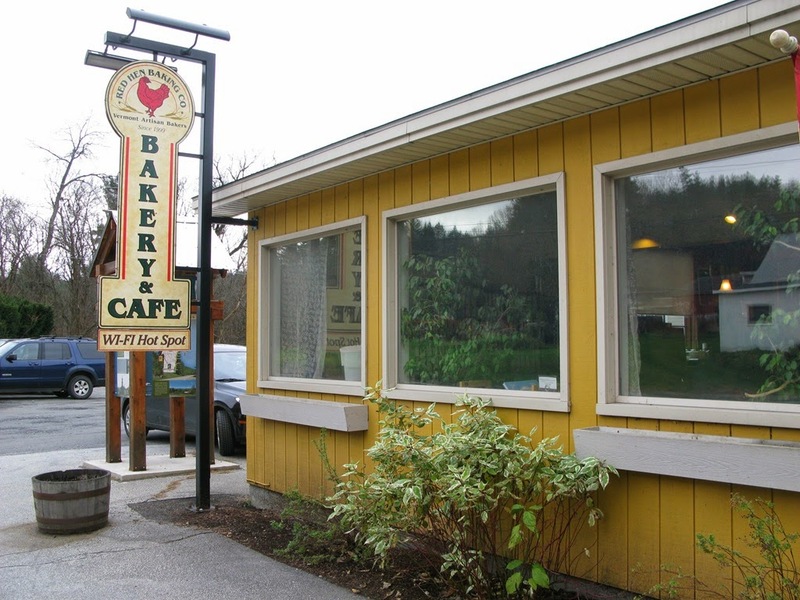 Yes indeed, occupying a good chunk of what was the restaurant part of the motel is the Red Hen Bakery and cafe. Their products state that they have been around since 1999 but if they have been we don't know where else they were. They opened at the present location in Middlesex probably about 5 year ago and have been a big hit. They make truly delicious breads and pastries and have a large viewing window in the cafe so that you can see the bakers in action. They also sell any of a number of Vermont made products of excellent quality. They are open 365 days a year and getting fresh bread in the morning to go with breakfast is something we have taken to doing up there all too often. 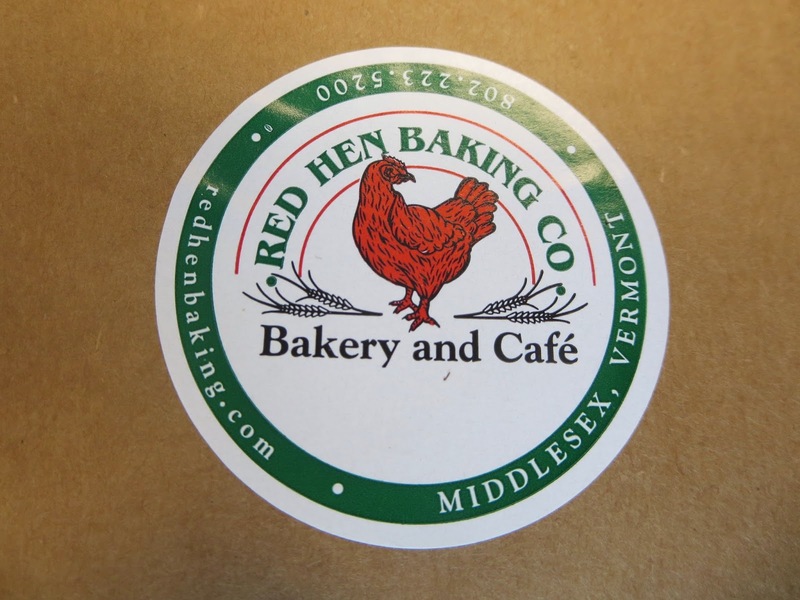 Check them out at http://www.redhenbaking.com/. Camp Meade becomes the Red Hen - with Wi Fi! Their logo though we don't know where they were before 2009. Our cake hour selection from Vermont! Right from the Red Hen itself! For cake hour though we went with their apple pie. 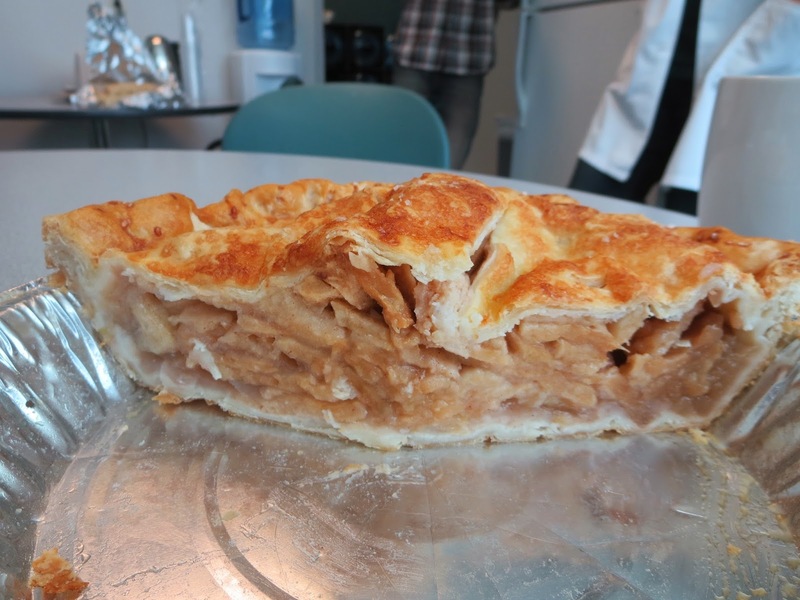 True to their recipes, the crust was awesome, the apples were well seasoned, not too sweet and cooked through like they should be. 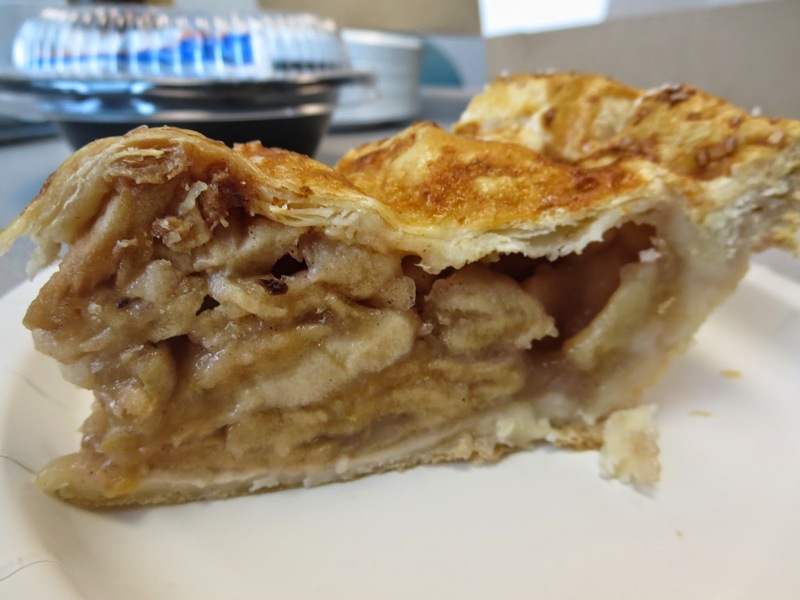 Too often we see apple pies where the apples are crunchy meaning not cooked. 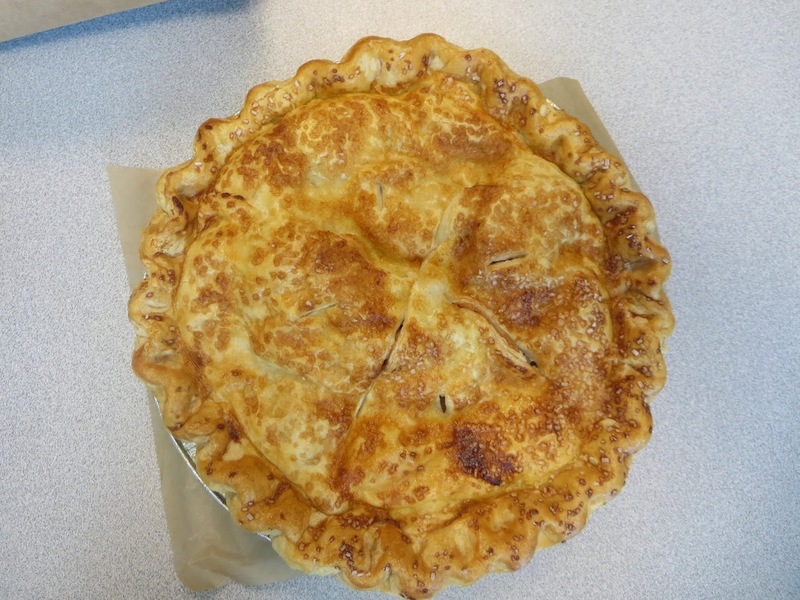 This was and exceptional pie and everyone noticed it. Apparently there is something to be said for quality products and processes. 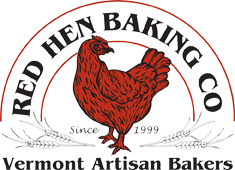 It you are driving through Vermont on Interstate 89 the bakery is just off exit 9 to the east on US Route 2. It is worth a visit for the bread alone which man could probably live by. The Maple sticky bun is also something to go for. 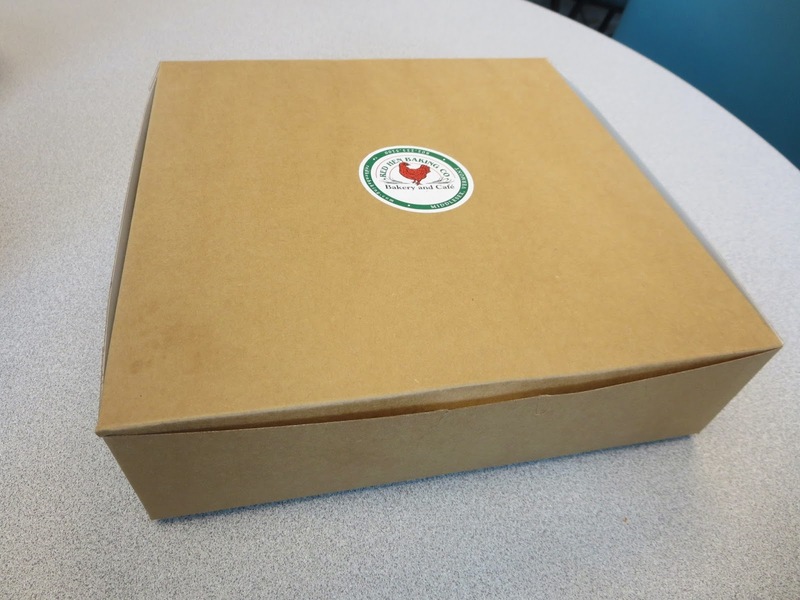 Inside the box one great looking pie! It is disappearing fast as can be expected because it was really good! 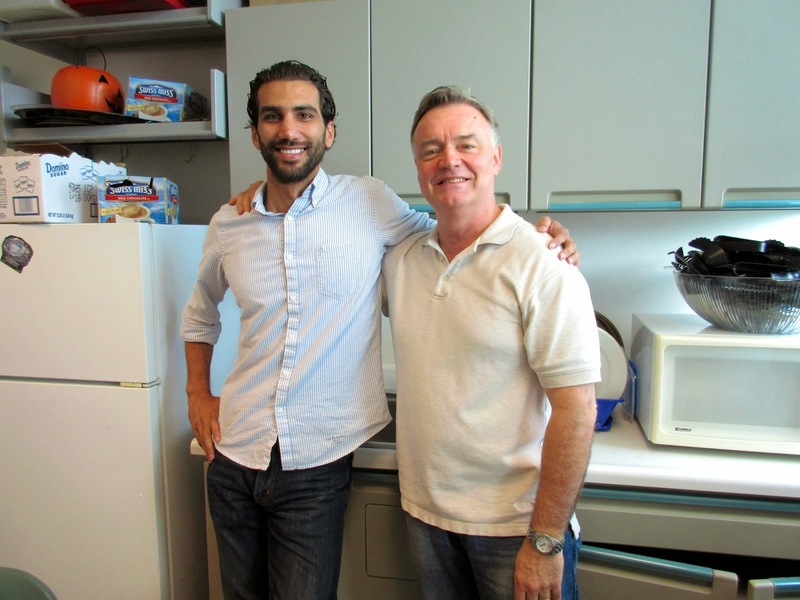 One of our colleagues finished off his on year Masters Degree program upon turning in his thesis. 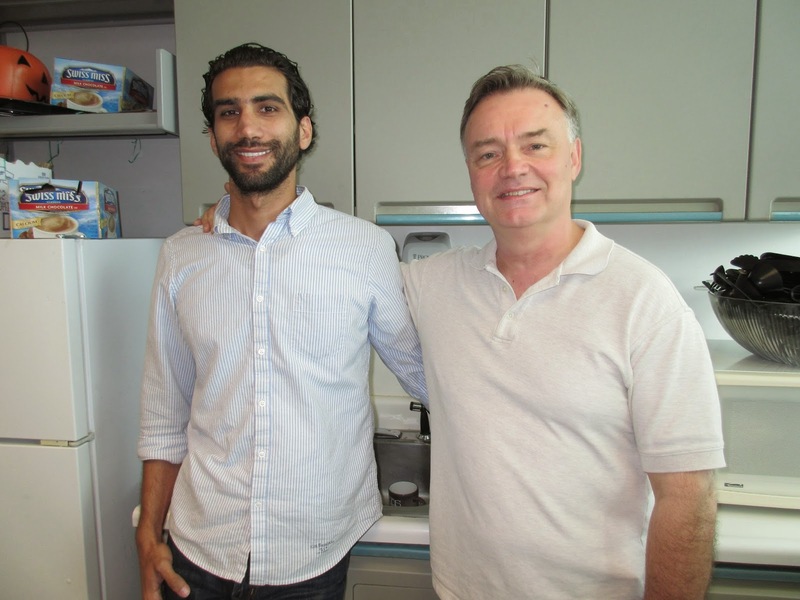 One of his close coworkers, now going for a PhD, promised to make something special for him. 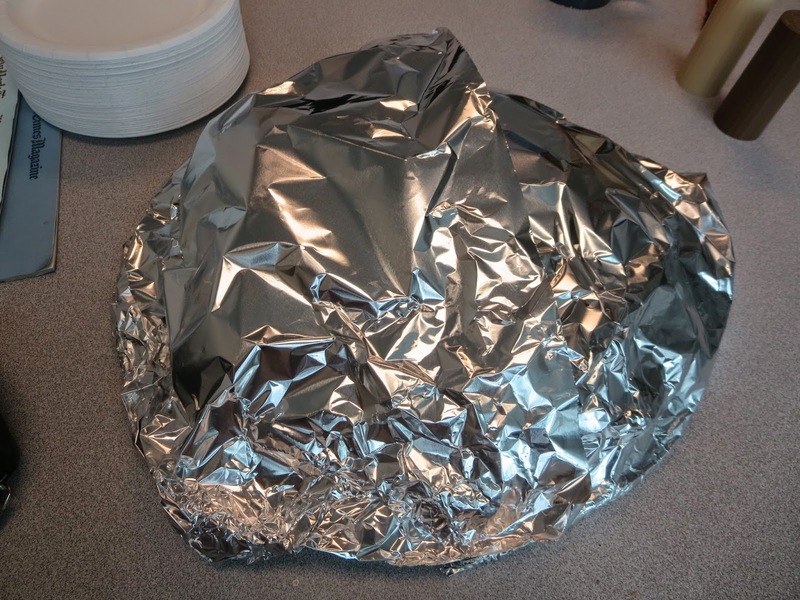 There is was all wrapped up in aluminum foil. 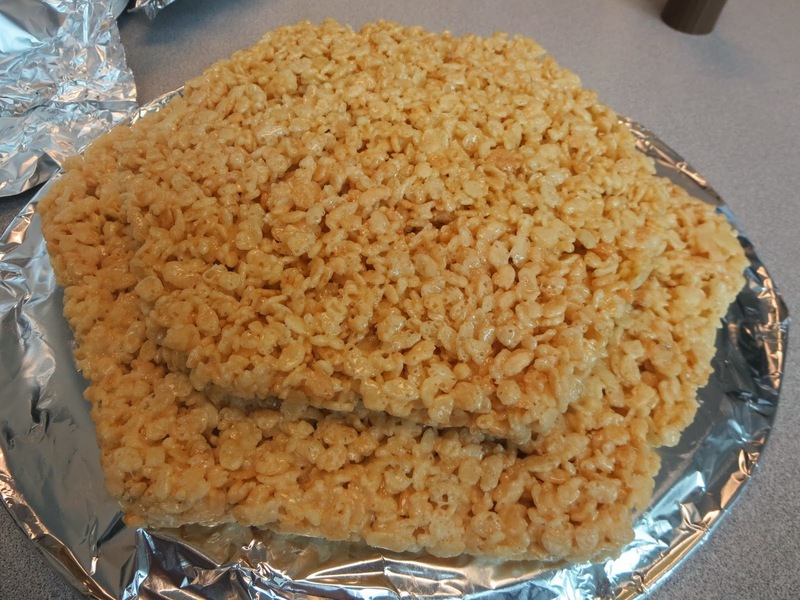 We naturally were very excited to see what it could be so we opened it up to find - one really big Rice Krispies treat!! 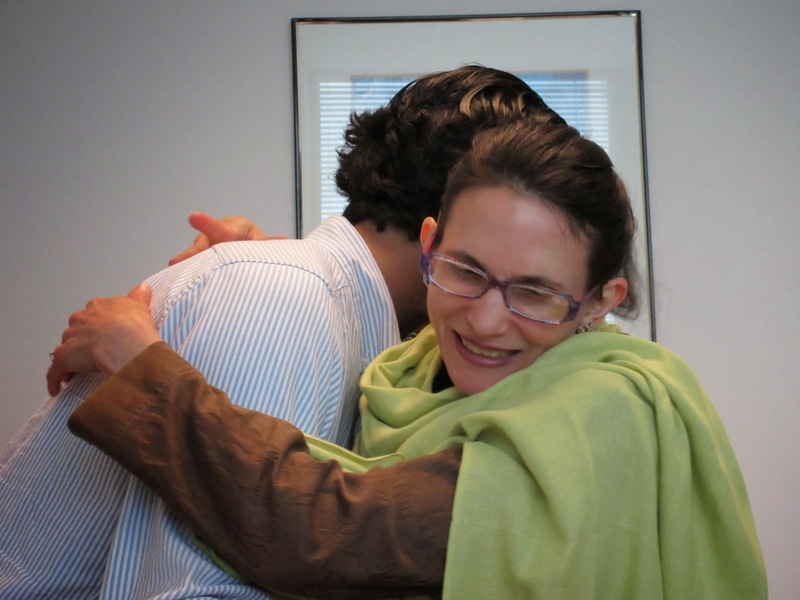 A surprise awaited to celebrate the Masters Degree! Is is is supposed to represent a virus? Or is it indicative of a benzene ring? Whatever - he got his Masters and a big Rice Crispies treat! The shape - being hexagonal - was determined to be inspired by something related to the biological or chemical field. Some interpreted it to be representative of a virus or a benzene ring. It was a different shape for sure. There were two layers of differing size so we had a two layer treat. 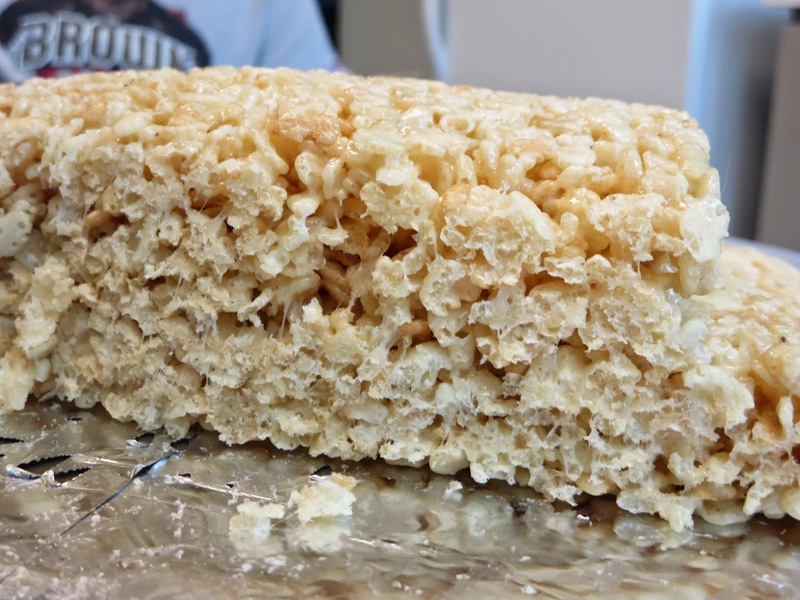 It was easier to cut than expected and tasted as you would expect a homemade Rice Krispies treat to taste. 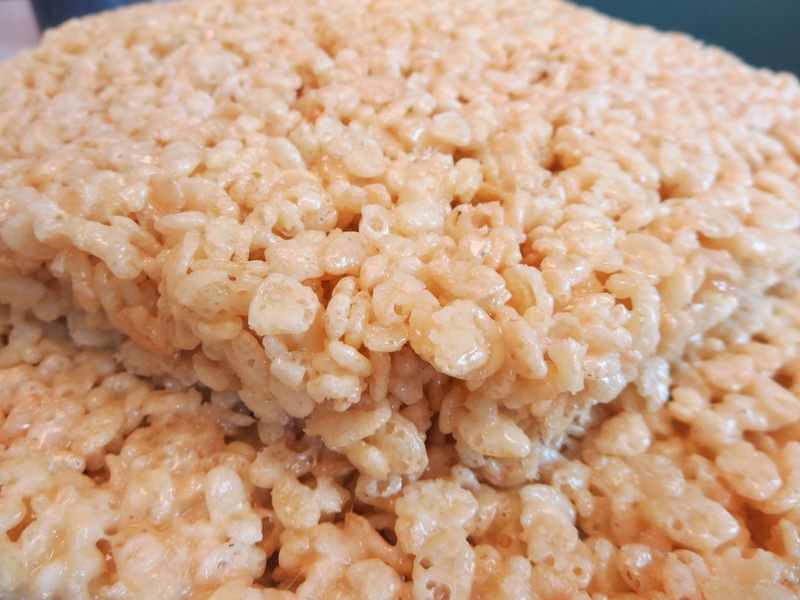 These are incidentally made from butter, marshmallows and Rice Krispies. They are not baked just formed into something as they cool. BTW - if you ever see the commercial product in the store or in a vending machine save your money! They are terrible. It's the homemade version or nothing. Two layered homemade cake style! Classic appearance not be found with the commercial product. The treat(s) was pretty popular. It was also very familiar to our colleagues from China. What was told to us was that back in the days of Mao when the majority were not at all affluent, a similar type of product made from rice was somewhat of a staple for celebrations at which we would normally feature a cake. As one of our friends explained, no one could buy cakes back then and so these puffed rice kind of treats, covered with chocolate or frosting and elaborately decorated for an occasion were a common substitute. 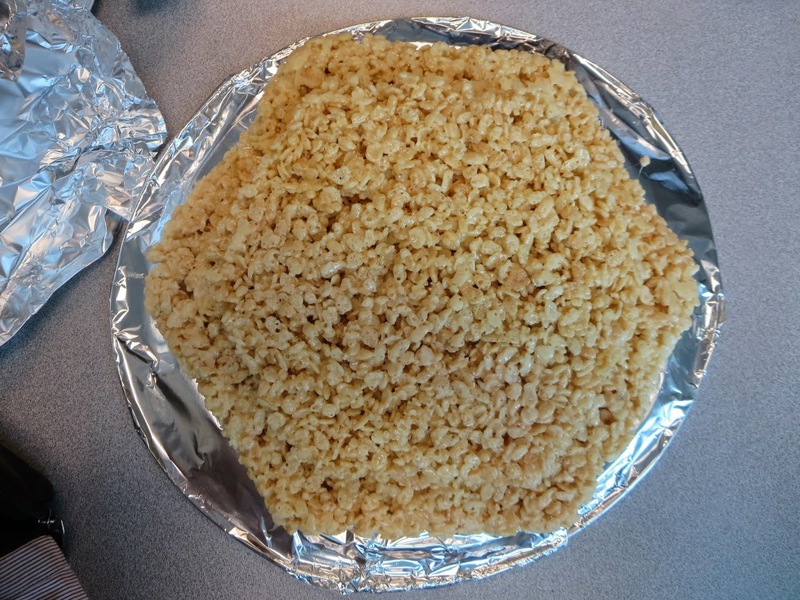 Who could imagine that Rice Krispies treats would turn out to be a cross cultural phenomenon? Chinese New Year's version of the treats! And for extra fun make them into balls!